Pachypodium are a group of spiny succulents originally from Africa. 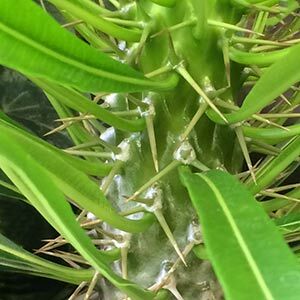 They are a varied group of plants ranging from small shrubs to small trees, all are covered in spines and most are sparsely foliaged. The species P. lamerei is commonly known as the Madagascar Palm, grown widely as an indoor plant however in its natural environment this long lived species can reach 5m in height. Pachypodium have very interesting flowers and with 20 -30 species variety in growth form is available. Pachypodium gracilius (pictured right) is one of the smaller growing species, slow to establish, however over time it can still reach around 1m in height. It will form a large rounded caudex with multiple stems. Yellow flowers in spring. 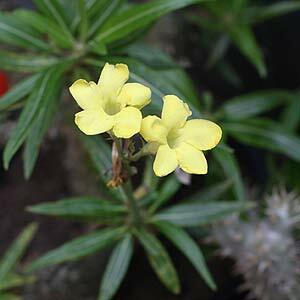 Pachypodium can be grown indoor in cooler climates but require regular watering and a free draining open potting mix. The deciduous Pachypodium Lamerei also known as the Madagascar Palm, with its fragrant flowers and distinctive thorny trunk. The yellow flowering Pachypodium cactipes. P. geayi which will grow to 4m.